You are looking at Patrick's winning entry in round two of the bake-off, brownies. The sea salt definitely tipped him over the edge. I rarely make brownies, finding it too difficult to achieve that perfect texture combined with the right kind of chocolate/fudge flavor. 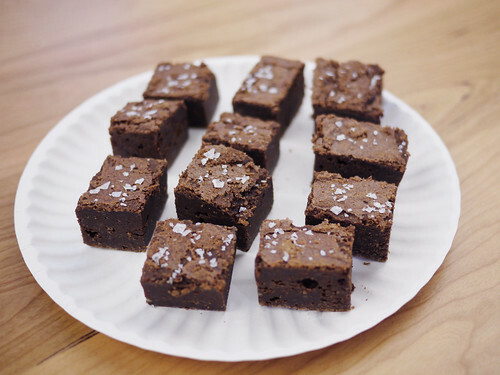 It's also harder to judge brownies than you would think. A lot of milk is helpful. Damn it Heidi, I should have asked you first! I was scouring for recipes, having never made brownies before.